For clients looking to achieve the best quality at the most affordable rates, 35mm Negative Scanning by PhotoScanning.ca is an ideal solution. We've re-purposed legacy equipment out of large scale photo labs to utilize the fantastic Kodak colour inversion process with the same quality output that your local photo lab used to make prints - rather than sending the file to the printer, our process creates a stand alone JPG file, suitable for editing, uploading, archiving and more. Minimum of 3 Frames Per Strip - Must Scan Whole Strip. All orders receive up to 5 DVD copies (default of 2) or a .zip file cloud download complimentary - 8GB USB keys are available for $6 if required, or can be provided by the client. Digital ICE Dust and Scratch Removal - Included for all colour 35mm negatives. Auto Exposure & Colour - included - Our process reads the DX code of your film, telling the scanner how to interpret your specific film & camera settings. Digital ICE is only available for Colour Film (as an infrared pre-scan will not work with Black & White negatives), and DX codes can only be read from films that contain them. 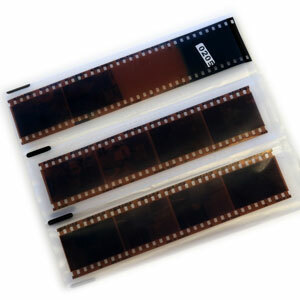 Many clients have their negatives stored in the retail negative sleeves that were provided during the develop process. Our process is intended to bundle negatives per roll, and folders can be identified with between 25 to 45 negatives. The DX Code information contains the frame number, and our process orders these files by frame number prior to our renaming process at the end of the job (files are labelled sequentially, image001.jpg, image002.jpg, etc). 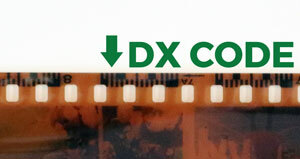 Film submitted with DX Code information will be sorted & renamed based on original frame number within the roll. Do you have 120 format negatives to be scanned for your organization, company, or archive? PhotoScanning.ca is one of Canada's largest medium format scanning outfits, offering our services in this respect exclusively to large archives above 10,000 items - learn more in our Large Volume section about how our innovative and budget first approach can produce incredible quality images with micro organization for fractions of the price of our competitors.